The Mount Washington Valley is ideal for a family ski trip, with four ski areas in striking distance, and lots to do après ski with the kids. Our favorite place to stay in The White Mountains is Jackson, crossing over the 1876 “Honeymoon Bridge” you are in a winter wonderland. The most beautiful setting is the Eagle Mountain House, a grand historic hotel that sits high on the hill above the charming Jackson village. This landmark hotel is highly scenic, storied and surprisingly kid and pet friendly. The Eagle Mountain House is an historic gem in the heart of NH’s mountains, as evidenced by the grand lobby’s wood work, the fireplace, antiquated 1916 brass elevator and wooden telephone (all of which are still operational). Of the remaining grand hotels in the Granite state, Hotel Mount Washington, Mountain View Grand, The Balsams, and The Wentworth, The Eagle Mountain House may well be the most affordable and best for kids, not as stuffy and sophisticated as its same vintage sisters. Originally built in 1879, the Eagle Mountain House was rebuilt in 1916 after a devastating fire the year prior. 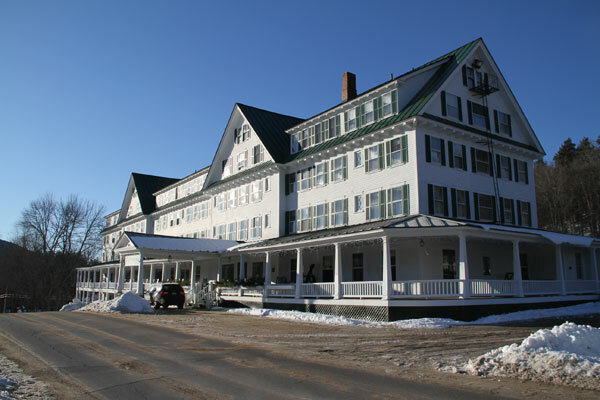 This grand hotel, with its graceful veranda and 96 guest rooms in the inn, is on the National Register of Historic Places, awarded as a Historic Hotel of America as well. It should also be on ski families’ lists who appreciate historic hotels, with four ski areas nearby, Black, Atittash, Wildcat, and Cranmore, plus Nordic trails on premise. A crackling fireplace awaits at Eagle Mountain House after a day skiing, in the lobby are fresh baked cookies, coffee and cocoa. Parents can perch on a bar stool at the Eagle Landing Tavern for après ski while the kids discover the downstairs Game Room or board games in the Library. Outside on the sweeping snow covered grounds, the Hotel golf course in summer, is a perfect sledding hill and a groomed circuit of Nordic ski trails. The views from every room is lovely, and serene in this quieter Crawford Notch. Evenings at the Eagle Mountain House, Chef Vanessa creates daily locally sourced entrees, in addition to bountiful fresh salads, and specials like big juicy burgers for more casual fare, plus a kids menu. School holidays and vacation weeks, kids’ pizza parties in the Game Room allow parents to enjoy the Tavern and a quiet dinner at a window table at Highfields. Riding the vintage 1916 elevator up to the 2nd to 4th floor of this century old hotel is an experience, adult supervision required on this relic. The authentic floors in the century old Eagle Mountain House are creaky, the doors squeaky, décor is modest and far from modern – but the mountain views and the ancient corded phone in our room will be education on your family vacation – of a simpler, more-stately time. The hotel is scheduled for renovations, we hope they don’t change many of the historic and happy aspects of this grand property. Yes, there’s free WiFi, but Eagle Mountain House is a place to reconnect with your family, maybe make some new friends in the Library with its piano. Mornings are gorgeous as the sun peaks over the mountains and you enjoy a home-cooked breakfast before heading to the White Mountain wonderland of alpine skiing, snowmobiling, snowshoeing, nearby Conway shopping and waterparks.